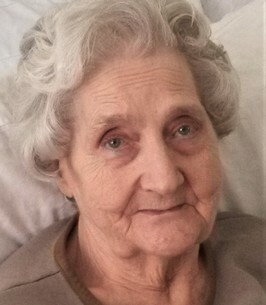 S. Jean Moore, 80, of Tyrone died Monday October 1, 2018 at Epworth Manor. She was born October 2, 1938 in Tyrone, a daughter of Elmer and Myrtle (Caber) Parsons. On August 26, 1961 in Tyrone she married Ray Allen Moore. He died March 2, 1998. Surviving are two daughters; Betty Stevens of Altoona, Melissa Alec and husband Thomas of Tyrone, five sons; Stan and wife Edith of Tyrone, Tim and wife Tammy of Altoona, Ray Jr. of Tyrone, Rick and wife Tina of Tyrone, Troy and wife Rhonda of Tyrone, 22 grandchildren, 33 great-grandchildren, 8 great-great-grandchildren, and a sister Betty Thomas of Sarasota, Florida. She was preceded in death by a daughter Sheena Stevens, a brother Walter Parsons and a sister Eva. She was a certified nursing assistant at Epworth Manor for 5 years. She enjoyed camping and being with her family. There will be no visitation or services. Arrangements by Feller Memorial Home. To send flowers to the family of S. Jean Moore (Parsons), please visit our Heartfelt Sympathies Store. We encourage you to share any memorable photos or stories about S. Jean. All tributes placed on and purchased through this memorial website will remain on in perpetuity for future generations.